You are here:Home / How To / $500 vs $5,000 Grills-Whats the Difference? $500 vs $5,000 Grills-What’s the Difference? One of the first questions I often get asked is “what is the difference between a $500.00 grill and $5,000.00 grill? To answer this question I like to divide the grill market into 3 classes. 1.) The first class is the big box stores that offer grills in the 200-400.00 dollar range that are made of a thin gauge magnetic 418 or less Stainless Steel. These grills will cook well when new but over time (2 – 3 years) the grates and burners will fail. I myself have purchased a 300.00 grill and within the 2nd season was cooking over a ball of flame coming out one side of the burner. These grills are designed to be repurchased on frequent basis with no real brand loyalty. Warranty is usually one year on burners and often is hard to get replacement parts. Models numbers change frequently. 2.) The Second class is very interesting! These grills start about 400 and move beyond the 1,000.00 dollar mark, they cook well and offer a durable exterior and firebox with some good features. These grills can last 10+ years with some care and maintenance. The problem with these grills is again typically the burners and the grates. These grills are built for reoccurring revenue streams for repair parts. The grill exterior and firebox is still in good condition and the parts are priced enough below the original sticker price that some people will replace the parts rather than ditch the grill. Typical cost for replacement parts can be 300.00-600.00 for a new set of burners and grates. Warranty on the burners and grates is usually 3-5 years with most of the grills not getting registered within the 30 day period, therefore the warranty is sometimes void. Parts are easy to find and purchase. Most of these grills will have at least one replacement set of burners and grates or more before a decision is made to replace the grill. There is a good following of customers in this class that will buy the same brand. 3.) The Third class This class of grills will offer a lot of features that make sense in a permanent structure or heavily used environment. The grills are made of heavier gauge higher quality 304, 318 or 443 Stainless Steel. The burners and grates are made to last with a lifetime warranty and offer better control of high and lower temperatures. The prices typically start at 1,200.00and quickly go up past the 10,000.00 mark. Most of the lower price grills in this class are being imported and the higher priced grills are built in the USA. You will also find larger burners that produce 15-30,000 BTUs per burner giving you a hotter and faster temperature control. 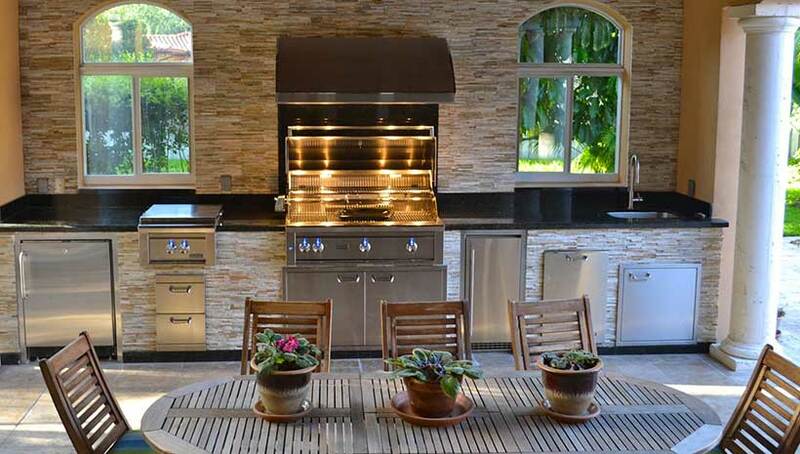 These grills are often the last grill that someone will purchase and offer the ultimate power and cooking experience.